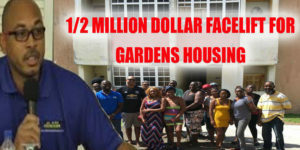 Residents of The Gardens Housing Project heaped tonnes of praise on the Dr Hon Timothy Harris led Team Unity govt for the attention being paid to their homes. The Gardens Housing Complex has received a much deserved and long overdue facelift and upgrade. After being neglected for over 20 years by the previous Douglas-led Labour Administration, the Team Unity Government, through the NHC, has finally stepped up to the plate for the residents of the housing project and have implemented some badly needed renovations and rehabilitation of the multi-storey residential structures. The Residents singled out the Minister of Housing Hon Eugene Hamilton and in particular Ambassador Jonel Powell who lobbied for the much needed upgrade and facelift for the housing project. The NHC and their staff and workers also received a big thumbs up for the work done. Ambassador Powell was instrumental in ensuring that the NHC and the residents were in sync and as much of the facility and structural concerns of the residents were met with the over half million dollar upgrade and renovation project.